The holiday season is always a time of reflection for us. We think about the pups we’ve healed and the pups that we’ve found homes for and those that will stay on with us as permanent fosters. There was Joni dumped in a shelter after being starved and had little hair left on her rear end from malnutrition. And, Clyde—he came in about 5 years ago with a broken rear leg that had not been treated and fused so he could not bend it. He went to a wonderful couple for 4 years and then had to be rehomed because the couple had a new baby with terrible allergies. They were broken hearted but had to return him to GDRI. He’s now in his forever home. Elvis came to us with overgrown nails, malnourished and a bacterial infection over his entire body. Elvis needed to be an only dog and a wonderful new adopter stepped up and adopted him. Old Zeus was surrendered at 10 years old through no fault of his own and Charlie who was going to be shot in the woods because he had allergies and scratched constantly. Both were wonderful dogs and had wonderful outcomes thanks to GDRI. These are just some of the Danes that we were able to help because of your incredible generosity. We couldn’t look after the Danes that we do without your help. 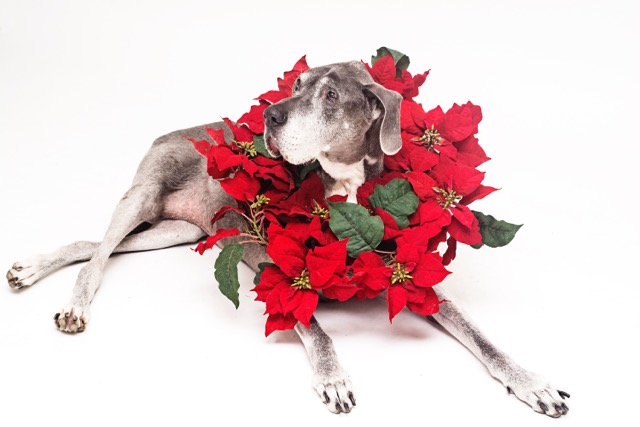 Every cent that is donated to Great Dane Rescue Inc. is used to support our Danes. We are a 100 per cent volunteer organization. Help us help them this Christmas with a donation. Our Danes thank you and wish you Happy Holi-Danes!